This exchange occurred a few days after MD and I attended a lovely wedding reception that featured a trivia game that each table could play together as a team, against all the other tables. The questions centered around the bride and groom -- their old jobs, claims to fame, those sorts of things. (And also, not exactly randomly: "What is a kleroterion?") Between me, MD, the groom's old college friends, and our friend the iPhone, Table 8 won soundly. Our prizes? We each got a copy of the new Harry Potter book. I've never read the Harry Potter books. Well, I take that back. I read about 20 pages of the first one, and then got bored, and then stopped. MJP (the bride) had once dragged me to see the first installment of the films, and that was all well and good except that it did nothing to make me want to see the second one. It's just not my thing. I sometimes feel like I'm missing out on the Cultural Phenomenon Of Our Time, but I feel like I already shot myself in the foot just by voluntarily opting out of a life in the city and moving upstate for seven years of doctoral insanity. In any event, the following thought occurred to me this morning: here I am, slowly but surely making my way through William T. Vollmann's Europe Central, a devastatingly wondrous novel about the second World War, the Soviet Union, and Nazi Germany. At nearly 800 pages it's become an ongoing project of sorts, but one that I absolutely love -- the storytelling is full of heartache, breathtaking elegy, humour, and ... telephones. It's amazing. But the thing is, it's taken me, what, six weeks to get through just under 300 pages. And on the subway this morning I saw a woman around my age opening up the new Harry Potter, at around the 2/3 mark -- out of 800-odd pages -- and continue to read. And that came out less than a week ago. I'll admit that there was a moment of defeat that passed before my eyes. I can't seem to get through a book that I clearly am enjoying more than anything else I've read this year. And there everyone else is, speeding along through the heaviest book I've seen in ages. But then I thought: huh. There's a good chance that as I write this, millions of children will be finishing up the book. All 800 pages of it. A testament to quick reading, sure (and it's summertime for them ... oh, how I miss summer vacation! ), but when was the last time such a large book got this much attention and was actually read by a fairly sizable part of the population? It's kind of maybe sort of ... awesome, really. Merchandising tie-ins aside, the Harry Potter craze has gotten people to read again. Alone or together. It's created a culture of reading that I don't remember really seeing before. Last night, while waiting for KS at Loreley, I struck up a conversation with two fellows sitting next to me at the bar. One of them saw my open copy of Europe Central, and asked how it was. We started talking about books, and then he admitted that he hadn't read a book since ... 1990. 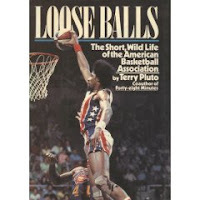 "Loose Balls," he said. "It was about the short-lived ABA, the American Basketball Association. Great book. Haven't read anything since then." I joked to this guy -- married -- that it was a good thing he wasn't trying to pick me up, since the whole "I haven't read a book since 1990" wasn't exactly the sort of thing a girl reading Europe Central would want to hear. My point: it's nice that Harry Potter's getting people to read again. And it's a little sad that one gentleman in the Lower East Side hasn't read a book in over 16 years. And also: I've got a copy of the new Harry Potter book, if anyone wants it. My other point: it's a question, really -- Now that the last Harry Potter book has come out, I know we've got two more of the films to look forward to, but ... What's next? What book/film/idea is going to become entrenched in the collective (un)conscious? And am I going to jump on the bandwagon? (I figure by the time the next cultural phenomenon takes root, I'll be just about done with Europe Central.) And: what's with fantasy? Between the Lord of the Rings films and the Harry Potter multimedia extravaganza, I'm wondering if there's something always already pleasurable about fantasy -- or if we're in a particular Moment, socially, culturally, politically, and/or otherwise, that makes the fantastic so potent. Or is it simpler than that? Is it the celebration of imaginative storytelling, the hearkening back to bedtime stories? And if that's the case, am I just an unimaginative, unloving old fuddy-duddy who insists on living in the real? Man. What's wrong with me? * There was a winky emoticon after his religion quip, and I'm actively refusing to include it.